The NIST Cybersecurity Framework includes standards, guidelines, and best practices to manage your organization’s cybersecurity-related risk. It provides a prioritized, flexible, and cost-effective approach for safeguarding your patients’ health, health information, corporate capital, and earnings from the impact of cybersecurity-related risks. 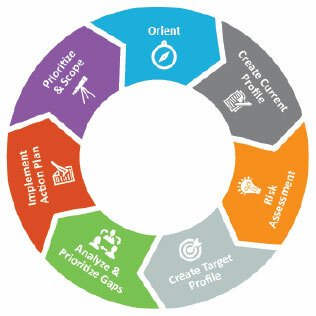 Rely on our expertise, our thorough systematic approach, and our unique software solution IRM|Framework™ to facilitate your organization’s adoption of the NIST Cybersecurity Framework. Our experts will help you form your project team, provide them with educational materials, and detail the entire process. We will work with your team to analyze your current cyber security profile and train them to use our IRM|Framework™ Software. In a two-day, onsite workshop, we facilitate a detailed evaluation of your current profile and work with you to identify an appropriate target profile for your organization while educating your team on the framework. Our software will dynamically create a dashboard showing your current implementation tier within the framework, a detailed list of all gaps between your current and target profiles, and a high level action plan. In addition, we will prepare an action plan to help you prioritize your next steps. Information security risk management has been a long-standing requirement in healthcare privacy and security regulations. However, compliance with regulations does not necessarily imply an organization has a “secure” information systems environment. Clearwater’s NIST Cybersecurity Framework Implementation WorkShop™ assists your organization in adopting the government recommended cybersecurity framework while offering education, procedures, and software to help you strengthen and maintain your information security program. Interested in how we can help your organization with NIST Cybersecurity Framework adoption?